Chris Pizarro is a Koi Artist whose subjects are associated with the decorative varieties of domesticated pet carps that are commonly kept in outdoor ponds or water gardens. Koi fish are a very common theme in traditional art, and also carry significant artistic significance in Asian cultures including the Philippines. Chris Pizarro’s Koi art plays an important role in the World of Feng Shui so this is the reason why many art collectors like collecting Koi art as Koi is a mystical fish that can bring fortune and wealth to any home. So many Chinese people believe that having a painting of fish in your home will bring you wealth and riches. Where Expressionism moves towards Realism, Koi artist Chris Pizarro is primarily known for juxtaposing Asian imagery with a highly-nuanced technique. This masterpiece is of realist technique and suggests the threefold language of color, shape and texture in oil on canvas where koi fish make up much of his subject matter. Whether painting undulating lines of light running along the scales of a fish or plush and billowing color on the petals of a dewy flower, these works draw upon deep reservoirs of sensory awareness evoking a peaceful and spiritual calm. 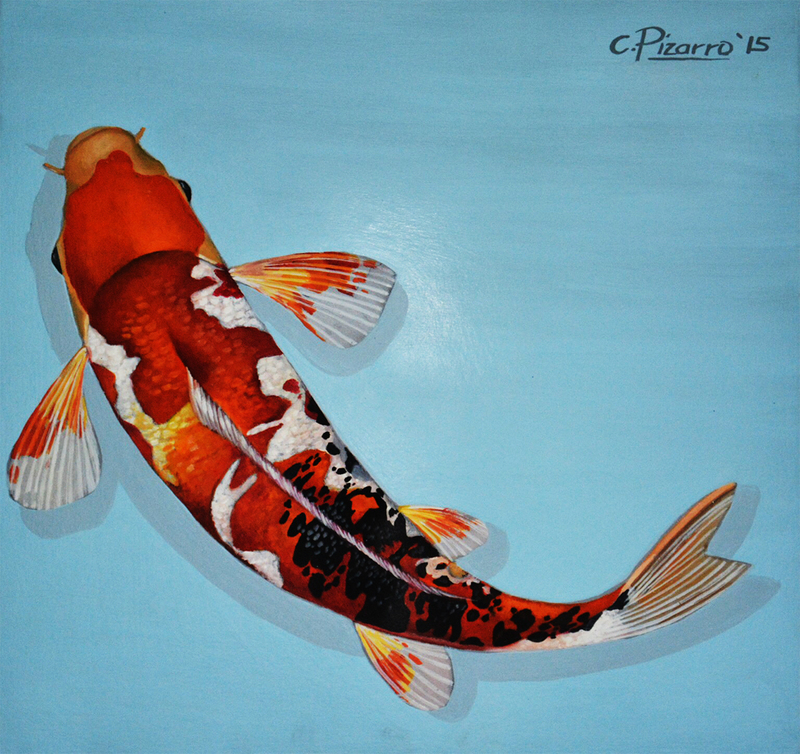 Chris Pizarro’s Koi painting was achieved by first applying layers of oil pigment for the texture using a combination of techniques for the 3D dimensional quality. His gestural curved lines and choice of background focus on movement and space. Chris Pizarro, born July 27, 1964 in Pilar Bataan, has been involved professionally as a freelance commercial and fine artist since 2001. Chris is a graduate of University of Santo Tomas in Manila, Philippines, with a degree of Bachelor of Science with Fine Arts Major in Painting under the tutelage of Professor of Antonio Austria, Terence Ruiz and Danilo Santiago. He is also an active member of Koi and Fish Art of the Philippines (KAFP), Visual Artist of Parañaque (VAP) and Las Piñas Art Society (LAS).